Do I have to order a full week of meals? Is there a minimum order required? Not at all! Order as many or as few meals a week as you like. We have no minimum order or commitment plan. We do not have a minimum order requirement to place an order, however please check our delivery map to see our delivery area and potential minimums to avoid delivery fees. Delivery fees can be waived in most instances by hitting a delivery day minimum total. I missed the deadline for ordering, can I still place an order? Can I request a change to my meal? We unfortunately cannot accommodate orders for delivery or pre-order pickup after the deadline cut off time. However, you can walk in, anytime, to our Downtown Sacramento or Roseville locations without pre-ordering meals to make a purchase! We do not currently accommodate any custom changes to our meals. We do list out all the ingredients used per meal, both on our website and the meal label. We do now offer custom meals! Please check out the options available by clicking the "Custom Meals" tab in our menu bar. We do list out all the ingredients used per meal for a regular menu items, both on our website and the meal label. How far in advance do I have to order? Do I have to return the meal containers, re-usable bags, and ice packs? Orders close at 10am the day before delivery. The time for cutoff is exactly 10:00:00am, whether or not an order is in process. The dates on our website turn red to indicate an order date is for the following week and we always recommend refreshing your browser before placing any order to ensure dates are updated! Always review your summary screen and email receipt for your specific delivery dates. If you have any questions please give our office a call or you can reply to your email receipt anytime! Please help us lower our delivery costs and reduce waste by leaving out bag(s) on your next delivery day or by dropping your bags off at any of our drop-off locations. Bags are tracked by an assigned customer number. As described in checkout, FitEats bag(s) used during delivery must be returned within 21 days from the date of the order delivery or there will be a charge of $4.99 to replace the bag(s). We do not currently offer a bag pickup for days in which you do not have a scheduled delivery. We will always pick up bag(s) as we drop off new orders to you. We do not need the meal containers back as we are unable to reuse them. The meal containers are recyclable, reusable, BPA-free, microwavable, and freezer safe! These containers work great for tupperware in your household, but if you're busy running around you can also just toss them in the recycling bin. We do reuse ice packs when returned. Our ice-surcharge is accessed for every delivery order. Unfortunately ice packs are not always returned, untrackable by order and also do not last long from wera and tear. This charge was implemented in 2016 to help us make up a portion of the cost for ice packs and maintain our current delivery minimums without fees. When do you deliver? Is your delivery time frame really 11pm - 6am? We deliver Monday, Wednesday and Friday between 11pm-6am to residential addresses. We do not deliver to businesses during our 11pm-6am delivery. We do offer a special business delivery time frame (more info below!) If you live close to our kitchen we might drop off the insulated bag before midnight. It is! We deliver during this time frame for many reasons! All items are delivered right to your front door, chilled, with frozen purified water bottles, in an insulated bag. There is no need to be home or available to accept the delivery. Where do you deliver? Do you deliver to apartment complexes, guarded and gated communities? We deliver to most areas in greater Sacramento. Please see our map on the homepage and enter your zipcode to check on availability in your area. We also now ship to all of California, Washington, Idaho, Oregon, Nevada, Utah and Arizona! Please enter your zip code on the bottom of our main menu page to see our delivery map for your area. We do! We deliver often to communities and complexes. Please ensure to include a gate code if applicable in your delivery instructions. If you live in a guarded or patrolled community please put “FitEats” on your delivery list with the guard to avoid issues. There was a problem with my delivery. What do I do? Can I pickup my order? Please contact us and we will promptly work out the situation with you. Please keep in mind we are a family-owned and operated business, with real people cooking and packing your meals. While sometimes accidents happen, it is definitely not our goal and certainly never intentional. We are genuinely sorry for these inconveniences and will always try our best to resolve each situation and come to a resolution! Yes! You can schedule a pre-order pickup online for any day we offer delivery. Pickups are available in the location you choose at checkout. KITCHEN LOCATION 9648 Kiefer Blvd. Sacramento, CA 95827, Pickup Times Monday 9a-3p and Wednesday 9a-3p, we are currently not offering pickups at our kitchen location on Fridays. There is also no need to pre-order at all to shop in our store locations! Just come in anytime during store hours to grab meals! MIDTOWN LOCATION 1420 16th Street, Sacramento, CA 95814, Pickup Times are Monday, Wednesday and Friday from 10a-8p. ROSEVILLE LOCATION 1455 Eureka Road, Roseville, CA 95661, Pickup Times are Monday, Wednesday and Friday from 10a-8p. We do not deliver to businesses during the hours of 11p-6am during our normal delivery. We recently opened up a special Business delivery to accommodate the needs of our local businesses! We currently deliver Monday & Wednesday to businesses in the Downtown Sacramento, Folsom, and the Rancho Cordova Business Park areas between the hours 10am-1pm. There is a $60 minimum for this special daytime office delivery. What is your refund policy? What do I do if I need to make a change or cancel an order? If you are dissatisfied with any of our meals please let us know and we will gladly replace your meal in a future delivery or create a credit to be applied to a future order. Please note we can only deal with issues that are brought to our attention in a timely manner and will always do our best to resolve issues brought to our attention, by our customers, within reason. There is a restocking fee of 25% when a refund is requested for delivery orders that were undeliverable when a customer is also unable to pick up the order when it is returned to our kitchen from delivery due to a customer error ( incorrect address, no gate code listed, etc). Every situation is different and will be evaluated as such. Please call our office or email us at support@fiteats.com. We can accept order changes and cancellations up until 10am before the delivery day. Any changes or cancellations after that time period may not be available or there may be an option to cancel with a 25% restocking fee when a refund is requested. Each situation is different, please contact us so that we may provide specific options to you. Can I get a refund or cancel a Gift Card or Package? We are unable to cancel or refund Gift Cards and Packages. We can pause Packages and restart them when you are available to receive them again. Gift Cards hold a balance until fully exhausted with no expiration date for use. Gift cards purchased online may only be redeemed online. Gift cards purchased in our retail store locations may only be redeemed within our retail store locations. Is your food fresh or frozen? I froze a "freezable" meal. How long do I heat it up? How long does it last? Our weekly menu is 100% fresh and never frozen!!! Some of our meals are labeled as “freezable” and can be Frozen for short periods of time to be enjoyed at a later date. Please keep in mind we do not use added preservatives when cooking our meals. This limits the amount of time a meal will Freeze. We recommend only freezing meals 10-14 days or less. Meals frozen for long periods of time may retain water if containers are not fully sealed. Please ensure containers are sealed fully prior to freezing. Please heat for the indicated time on the label, stir (if necessary), then heat an additional 1-2 minutes or until heated through. Meals labeled as freezable are intended to be frozen for short periods of time, recommended 10-14 days. Please note we do not use added preservatives when cooking which greatly reduces the freezable amount of time. How long do your meals stay fresh? I have food allergies. Can I order your food? Meals stay good for 5 days after delivery. Each meal will be labeled with a specific best buy date in which the meal is best enjoyed in that time frame when stored properly. If a meal ever goes bad within the Best by Date time period, please notify us so we can work on a solution for you. Please note that our facility uses peanuts, tree nuts and wheat products. Please understand that we are currently not able to accommodate customers with fatal or severe food allergies. We do list out our ingredients so that when ordering you know what you are getting and we also make every effort possible to prepare and keep meals separated. We do now offer custom meals as well that can be built around food allergies. 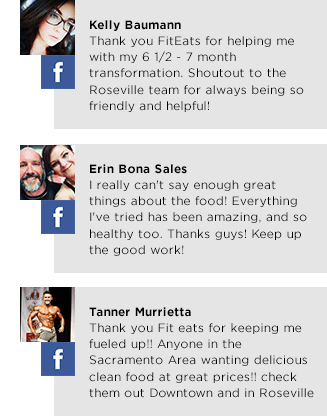 Please check out the "Custom Meals" tab in our menu bar. Are the meals Gluten-Free? How are the meals packaged and delivered? Many of our meals are gluten-free! Items with the Gluten-Free* tag are made with Gluten-Free ingredients. Please note that wheat products are cooked in our facility and we are not a dedicated gluten-free kitchen. Meals are packaged in recyclable/reusable containers and delivered in an insulated bag packed with frozen ice packs. When you get your delivery in the morning just unload your meals in the refrigerator. Are all your ingredients organic? What’s the difference between your Regular and Large meals? All our ingredients are local and/or organic depending on availability. All of our meals are packaged in individual serving containers intended for one person. Our Regular size contains 3.5-4 oz. of meat/protein, 2-4oz of starch, 3-5oz of veggies. Our Large size contains 5.5-6 oz. of meat/protein, 3-4oz of starch, and 4-6oz of veggies. When you receive your order, the Large meals will be indicated on the label. IMPORTANT: Keep in mind we do not serve portions like you might have at a restaurant, but instead our portions are based on specific nutritional guidelines. Nutritional information is provided to the best of our ability using information obtained from product labels. Information such as sodium content, is an approximate value. We change our menu every Thursday at about 10am. "NEW" items can be found on the main menu page at the top of each category, Breakfast, Lunch & Dinner. New items are available to order for the upcoming week and available in store the next Monday. Meals marked with "Last Chance" will only be available for the current dates listed online, and then that item will be discontinued. Smart Points are a way in which Weight Watchers(WW) members track the value of the food they eat throughout the day. We are unable to assign daily point values to our customers as this is exclusively done through the WW program, however we are proud to offer accurate point values on our meals!! ** As of February 1st, 2018, we have updated our website to include WW updated FreeStyle Smartpoints. How long have you been around? Where are you located? We are a family business, locally owned and operated for the last four years. How can I contact you for other questions?